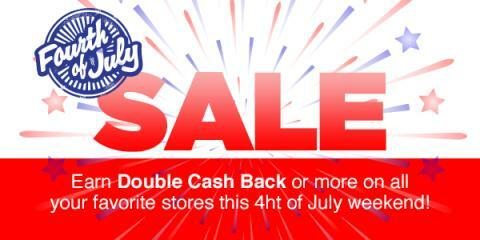 Swagbucks is currently offering double cash back or more at a number of stores for Independence Day. From JC Penney to Lowes, you'll get cash back (in the form of SB points) for buying your gifts online through Swagbucks. They also have offers where you can earn SB points towards free gift cards for things like trying Hulu. If you haven't signed up for Swagbucks yet, you can also do that at this page and start earning points towards your first free gift card. As a bonus, if you sign up through me a spend at least $25 shopping online through Swagbucks before the first of the month and you'll get a 200 SB bonus - that's $2 in addition to the points you get for each dollar you spend. These deals will run all the way through Fourth of July!